Milwaukee, WI -- Darrun Hilliard scored 17 points and No. 6 Villanova connected on 11 shots from long distance in an 87-76 victory over Marquette on Saturday. Ryan Arcidiacono scored 16 points for the Wildcats (25-2, 12-2 Big East), who have won eight straight since a loss to Georgetown on Jan. 19. Dylan Ennis had 14 points, seven rebounds and six assists, while JayVaughn Pinkston gave 14 points and nine boards in the win. JaJuan Johnson recorded a game-high 20 points and five assists for the Golden Eagles (11-15, 3-11), who have lost their last three games. Luke Fischer had 17 points and five boards in defeat. Villanova trailed for the first several minutes of the game, but four straight points from Pinkston gave the team its first lead of the game. The game stayed close for the next several minutes until the Wildcats used a 12-0 run to open a 41-27 lead after Hilliard hit a 3-pointer with just over two minutes to play in the first half. Marquette scored the next five points to keep it close, but Villanova still took a 43-34 lead into the break. Arcidiacono, who was just 1-of-5 from the field in the first half, warmed quickly in the second half. He drilled a 3-pointer on the first Villanova possession after intermission and then made another after Marquette responded with a triple of its own by Duane Wilson. A Pinkston bucket on the next offensive possession brought a Marquette time out to stem the momentum of an 8-3 Wildcats' surge. 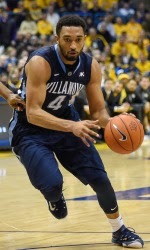 "A key was Arch coming out at the start of the second half and hitting those threes," stated 'Nova head coach Jay Wright. "It created some separation for us and kept them from getting this place going. This was a great college atmosphere in here today. If they had been able to come out at the start of the second half and gotten this place going, it could have been tough." Villanova kept the pressure on and steadily increased its lead, and a Kris Jenkins free throw gave the team a 63-46 lead seven minutes in. The Eagles scored the next seven points, and were still down by 10 after Johnson put in a layup with just under eight minutes to play, but the Wildcats scored the next six points to put the game away. Notes: The Wildcats reached the 25-win plateau for the second straight season and for the fifth time in the last 10 seasons ... The program's all-time record for victories in a single season is 30, reached in 2008-09 ... Villanova hosts Providence on Tuesday ... Marquette plays at Butler on Wednesday ... Villanova leads the series with Marquette, 16-9 ... Villanova shots 47.1 percent and held a 39-27 rebounding advantage.